Ciena has defied the tech-sector sell-off. Shares of optical transport equipment maker Ciena (NYSE:CIEN) have been defying the tech sector's sour mood recently. As of this writing, the stock is up a whopping 67% on the year, which, needless to say, trounces the S&P 500's negative returns. CIEN Year-to-Date Price Returns (Daily) data by YCharts. What's the secret to Ciena's success? For one thing, it's aggressively gaining market share in the optical transport industry on a global basis. Optical transport equipment helps increase speeds over a fiber-optic network. With the rise of cloud computing, 5G enhancements, and other connectivity-intensive applications, this market is set to grow over the medium and long terms. And yet the cyclical nature of equipment spending, along with intense competition, has made the industry anything but a sure thing for individual optical companies. 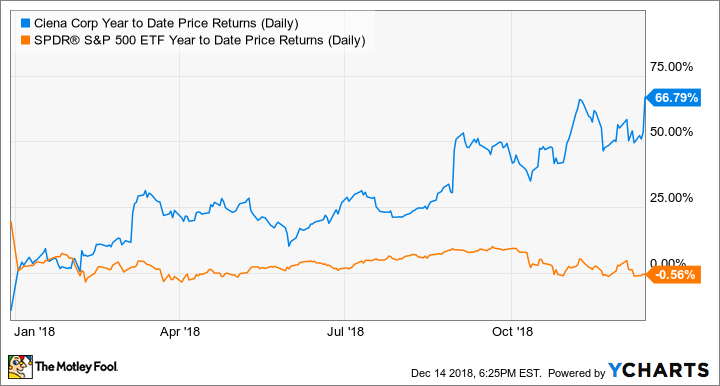 Ciena's recent fourth-quarter 2018 conference call with analysts shed some more light on why Ciena continues to win, offering lessons to investors. Ciena reported a strong fourth quarter, continuing the trend from the past year. The quarter ended on Oct. 31. Revenue and operating income in millions. YOY = year-over-year Data source: Ciena. As you can see, Ciena showed accelerating growth in the fourth quarter and delivered impressive growth for the year. The company's other 2018 accomplishments include paying off all its convertible bonds, which will limit the company's dilution going forward. In their place, Ciena was able to refinance its term loan, increasing the debt to $700 million, while lowering the interest rate and pushing the maturity out to 2025. The company also returned $111 million to shareholders in share repurchases over the fiscal year as part of the company's $300 million share buyback authorization. In light of the recent strength in the business, Ciena raised its three-year targets, which is likely why the stock surged higher after the announcement. The company now expects 6% to 8% revenue growth annually, up from its previous target of 5% to 7% growth. The company also now expects 20%-plus earnings-per-share growth, up from a long-term estimate of 14% to 16% given last year. The margin expansion will come from higher growth on the same level of operating expenses, as well as continued buybacks. ... we've seen a lot of opportunities to take share. And so, we've done that. And sometimes when we're taking share particularly if we're taking out an incumbent, we're going to take some onetime costs or early stage lower gross margins with the idea that over time, we will get back to a good gross margin on those contracts. Particularly, Ciena noted continued growth in webscale (aka cloud companies), which now makes up 35% of revenue. The company also expressed enthusiasm around its strong position in India as well as market share gains in both Europe and Japan. These two regions could also be in for more gains, as telco customers might look to replace Huawei equipment (from China) with other producers like Ciena due to national security concerns. And rumor has it Ciena may win more business from CenturyLink, taking it away from beleaguered rival Infinera. Ciena has defied markets this year even though the optical equipment market is cyclical, just like semiconductors or financials. Those sectors have both sold off violently in the second half of this year. What's Ciena done differently? It's used the industry weakness to take advantage of lagging competitors. In that light, the challenging industry environment over the past couple of years has been positive for the company, as it has given Ciena the opportunity to expand its market and customer base. The lesson: An industry downturn can make for great individual stock bets if you pick correctly.